Lion Air Jet Was 'Un-Airworthy' In Lead-Up To Fatal Crash, Investigators Say Indonesia's transportation safety committee's report addressed maintenance practices, pilot training and an anti-stall system on the Boeing 737. It did not identify a firm cause for the crash. Nurcahyo Utomo, an investigator for Indonesia's National Transportation Safety Committee, speaks at a news conference in Jakarta, Indonesia, on Wednesday, about preliminary findings from the investigation into the crash of Lion Air Flight 610. The Boeing 737 Max 8 crashed into the Java Sea less than 15 minutes after its Oct. 29 takeoff, killing 189 people. The plane had been in service only since August. Indonesia's transportation safety committee, known as KNKT, used preliminary data collected from the jet's "black box" flight data recorder recovered earlier this month in its report, which was presented at a Wednesday news conference. Almost immediately after takeoff, the report said the jet began to experience "stick shaker activation," which vibrates the pilot's controls. The KNKT says this is "considered as un-airworthy." Stick shaker activation is "very distracting and unnerving," former Boeing flight control engineer Peter Lemme told Reuters. "It's not something you ever want to have happen as a pilot." According to the report, a sensor falsely signaled that the jet's nose was too high. An automated Boeing anti-stall system pushed the nose down, while pilots tried to use their controls to bring it back up. Data showed the 737's pilots managed to pull the jet's nose back a total of 26 times from takeoff until its plummet into the sea in what Lemme has called a "deadly game of tag." This automated system is called the maneuvering characteristics augmentation system, "a computerized system Boeing installed on its latest generation of 737 to prevent the plane's nose from getting too high," as The New York Times describes it. There are steps pilots can take to manually override the system, but it's not clear whether the Lion Air pilots aboard Flight 610 knew them. "In the aftermath of the crash, pilots have expressed concern that they had not been fully informed about the new Boeing system ... and how it would require them to respond differently in case of the type of emergency encountered by the Lion Air crew. "Boeing has said that the proper steps for pulling out of an incorrect activation of the system were already in flight manuals, so there was no need to detail this specific system in the new 737 jet." KNKT investigator Nurcahyo Utomo on Wednesday said the safety committee has not determined whether the system was a contributing factor. 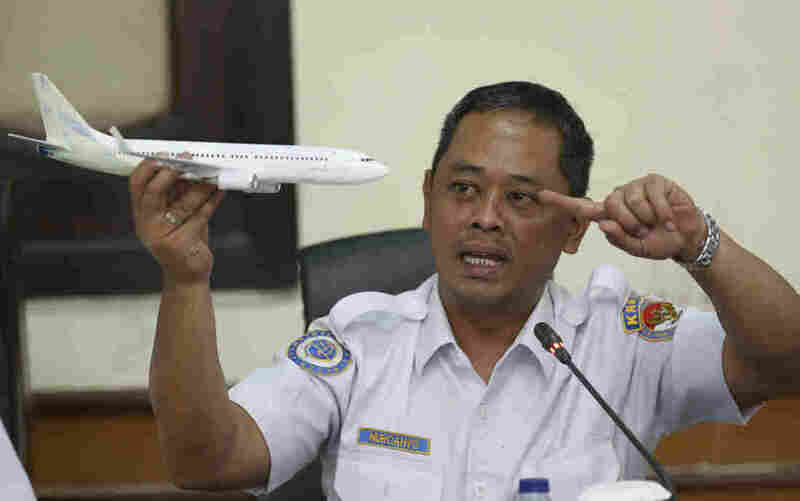 The preliminary report did not assign blame but did list new safety recommendations to Lion Air — "on top of earlier recommendations about the flight manual that have already been implemented by Boeing," Reuters reports. According to the report, the jet had airspeed and altitude issues in four flights in three days before the crash and had erroneous sensor readings several times. It was in an "un-airworthy condition" on its Oct. 28 penultimate flight. On that flight, the pilots shut off the maneuvering characteristics augmentation system and manually stabilized the jet after the system pushed its nose down too far. They reported the issue to Lion Air, which checked the 737 and approved it for takeoff the next day. Lion Air, a low-cost carrier that has expanded rapidly over the past several years, has a shoddy safety record with a number of incidents over the years — including a 2013 crash landing at sea that remarkably resulted in no fatalities. The U.S. and the European Union have in the past banned the carrier from operating in their airspace; both lifted that restriction in 2016. Investigators have not located the jet's cockpit voice recorder, which could provide insight into the pilots' last actions. A lot could be attained by investigators from the voice recorder, Utomo said.